Premade pages: Programs, Leadership, Timetable, etc. We’ve tried to include as many useful features into the template as possible to cover all your potential activities around this subject matter. It has the compatibility with the most popular events calendar to display what’s coming up and notify users about the time, place and the fee of a workshop, class or a cultural event you want to hold. The theme is made with Elementor Page Builder, as well as compatible with Slider Revolution, Essential Grid, MailChimp for WP, Contact Form 7, ThemeREX Addons. 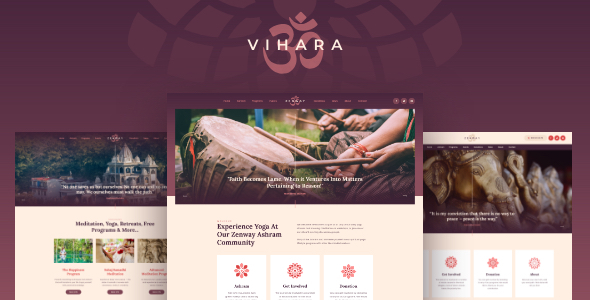 Finally, we’ve made Vihara WooCommerce compatible, to give you a chance to sell online and earn some extra money for your buddhist community. Go ahead and check out this amazing Buddhist temple WordPress theme!